Louisiana's favorite fishing destination awaits, just 2 hours south of Baton Rouge and New Orleans. Specializing in family services, Bridge Side Marina offers fully equipped cabins, beautiful private beaches and lighted fishing piers. 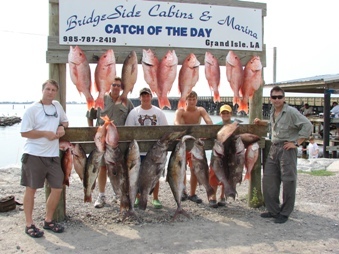 Our unique location at the southwestern tip of Grand Isle and Caminada Pass allows anglers to catch dozens of saltwater fish without ever leaving our marina. Thought I should share this big buck with yall hunters that my daughter had killed in MS. We were sitting in the stand together for a couple of hours and a doe came out. Then 5 minutes later I had to pass the gun to her; when this big 10 point came out about 90 yards. She shot it and we knew it was down! We high fived and yelled with excitement! It doesn't get any better than this, Good Job Renee!! !